By Zack Quaintance — Yes, San Diego Comic Con is more about movies and TV than it is about comics, but! That doesn’t mean there aren’t still some pretty cool comic announcements happening the week of/during the con (some of which I got to be in the room for!). These are, of course, announcements about real printed comics, dozens of which are somehow written and drawn and shipped to small businesses across the country each week (which is all pretty crazy if you think about 2018 and the media landscape long enough). With that in mind, we’d like to take a quick look today at 10 (plus one extra) of the coolest comic announcements to come out of this year’s con, ranked below in a fairly random order...let’s do it! Why It’s Cool: DC has essentially given Steve Orlando—one of its best writers when it comes to capturing the beauty to be found in obscure bits of continuity—and Travel Foreman—a visionary comic artist if ever there was one—a fairly-open canvas to do with what they will. This canvas—Jack Kirby’s Great Disaster future—is inherently Kirby-esque (seeing as he created it) and now we’ll get what is likely to be complex and surprising take on it spread through six issues. Sign me up. A potentially Dune-esque high-concept sci-fi story heavy with 2018 sensibilities by G. Willow Wilson and Christian Ward. Why It’s Cool: Speaking of visionary science fiction, have you seen the cover for G. Willow Wilson’s forthcoming Berger Books comic, Invisible Kingdom? Phew. The art is something, and the solicit evokes Dune-esque ideas of exploring the intersection of religion and commerce (presumably without all the stuff about how “spices” can expand one’s mind). Wilson is a thoughtful and attentive writer, and a take like this edited by former-Vertigo heyday editor Karen Berger is very cool indeed. Why It’s Cool: Speaking of cool oversight gigs, how about Gail Simone becoming the architect of Lion Forge’s still-nascent Catalyst Prime Universe? Cards on the table, I’d been contemplating jumping off this line after the former architect, Joseph Illidge, left for Valiant earlier this year, but now with Simone at the wheel I’ve scratched those plans and re-upped my excitement for this concept. Why It’s Cool: Speaking yet again (last time, I promise) about cool oversight gigs, Marvel announced that big ideas/bigger personality writer Donny Cates would be “showrunning” an event to commemorate the 20th anniversary of its classic (for my generation, anyway) line of Marvel Knights properties, which back in the day told prestige TV-esque stories about characters like Daredevil, Moon Knight, and Black Panther. Joined in this effort will be an exciting new guard of Marvel writers that includes Matthew Rosenberg, Tini Howard, and Vita Ayala. Cool! Why It’s Cool: From its inception, Shelly Bond’s Black Crown imprint at IDW (which has an aesthetic I describe as slightly drunk at a DIY punk rock show) has seemed to promise edgy and interesting comics, and the first batch was, indeed, strong. The second batch, however, is shaping up to fully capture Bond’s vision, starting with Euthanuats and continuing now with The Lodger, which is from the Laphams, a husband and wife duo behind the modern noir classic comic Stray Bullets. Rush album cover artists are burning with jealousy. Why It’s Cool: It’s Grant Morrison writing a cosmic book in the DC Universe, which alone would be cool enough to make this list, but, hey, it’s also Liam Sharpe on art! And his early work looks like an insane prog rock album cover. This, friends, is going to be epic. Why It’s Cool: I couldn't find a release date, but Kelly Sue DeConnick writing Aquaman in time for the character's spotlight via a new movie is super cool. DeConnick is an exciting and polished comic writer, perfect for pushing Arthur in new directions after Dan Abnett’s safe and slow-moving take on the character. Why It’s Cool: Chelsea Cain is coming back to Marvel, in spite of a harassment campaign that resulted from a character wearing a pro-feminism t-shirt in a book about a strong female secret agent. Groan. But it’s good to see Cain back! Her last book for Marvel, Mockingbird, was a complex puzzle box of a story about Bobbi Morse, a.k.a. Mockingbird, one that incorporated interesting character and relationship developments for its lead. Tom King’s Vision is an impossible act to follow, but it will be cool to see Cain, Marc Mohan, and Aud Koch tell their own story with everyone’s favorite Marvel android. 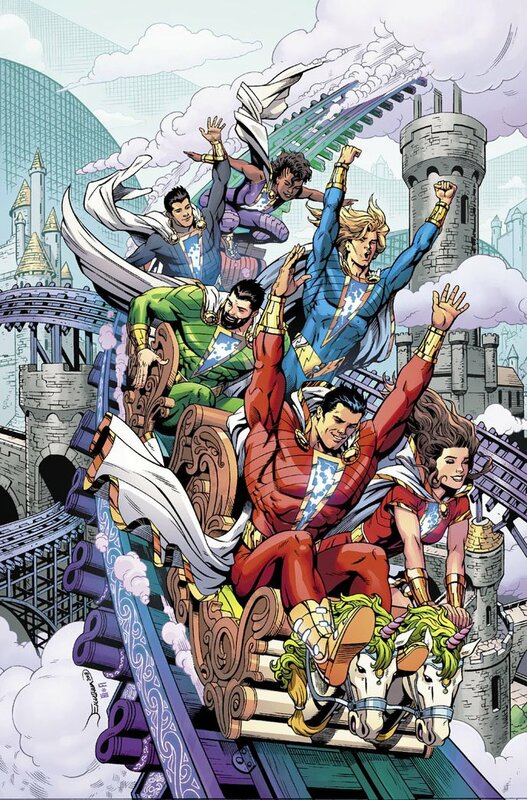 Here's hoping we enjoy this book as much as the Shazam family is enjoying this roller coaster. Why It’s Cool: Geoff Johns’ take on Shazam in the New 52 might have been a bit polarizing (I liked it well enough), but circumstances now seem right for him to tell a very cool Shazam story. He’s returning to writing as a main focus and is presumably fired up to do so. Plus, holy cow of all the new art dropped at SDCC, I think Dale Eaglesham’s Shazam piece is my favorite. Why It’s Cool: Kyle Starks, whose Rock Candy Mountain is quite possibly the funniest comic ever, is now collaborating with Chris Schweizer on a Mars Attacks story. Yes, please.